What could be responsible for the renewed interest? In 1993, a computer-administered Hamilton Anxiety Scale was developed to use in more extensive research studies as an alternative to the clinician interview version. It was shown to be almost as effective as the original practitioner-delivered version.4 The following year, Bruss and colleagues released a Hamilton Anxiety Rating Scale Interview Guide (HARS-IG). The purpose was to provide clinicians with a standardized interview format, allowing for group interviews and a reliable retest assessment tool.5 The simple, one-page observation questionnaire includes fourteen different domains, which consist of distinctive phrases and feeling associated with each domain. Inasmuch, it provides an indexed score which can be tracked serially across visits and compared to others indicating good intrasubject and intersubject reliability. These domains can be easily discussed with the patient and allow a natural conversation between practitioner and patient which is not necessarily a hallmark of similar tools. During the visit, a practitioner should take note of the patient's behavior at the time of the appointment. For example, was she moving around a lot in the chair or did they have a hard time keeping eye contact? Clinically, this short observation-based assessment does not evaluate or go into detail about every potential sign and symptom, therefore creating some limitations. However, the elegance of this easily administrated assessment is that one domain typically will not skew results unless the results border between significant and insignificant clinical findings. 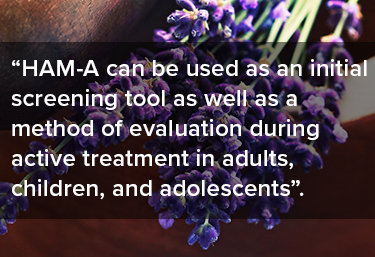 HAM-A can be used as an initial screening tool as well as a method of evaluation during active treatment in adults, children, and adolescents. It can be used by any clinician comfortable using it. Alternatively, it can be used as a reference or surrogate such that a clinician may not necessarily use the tool actively, but may make use of the results found in research that used the tool. This is not question that the patient completes prior or during a visit. The assessment should not be visible to the patient as this can skew results. The total administration time ranges from 10-15 minutes. Practitioners should not be surprised if the index yields higher results than the general population or even the typical patient seen by the practice as the decision to use the assessment is a potential confounder. Confirmation bias exists in this context but does not deter from the validity of the tool for the individual patient. The total score ranges from 0-56, with each of the 14 items being scored on a severity scale of 0 to 4. Low scores indicate greater function. A score of 25 or higher, likely calls for a psychiatric referral. Patients with scores between 18 and 24 can likely be managed by a non-specialist or an over-the-counter approach. If the score is 17 or less self-care exclusively is often recommended. Hamilton M. The assessment of anxiety states by rating. Br J Med Psychol. 1959; 32:50–5. Alexandru Dan Corlan. Medline trend: automated yearly statistics of PubMed results for any query, 2004. Retrieved from http://dan.corlan.net/medline-trend.html. Accessed on 2018-02-26. Bruss G, Gruenberg A, Goldstein R, Barber J. Hamilton Anxiety Rating Scale Interview Guide: joint interview and test retest methods for interrater reliability. Psychiatry Res. 1994 Aug;53(2):191-202.